Any eligible candidate, who aspires to join any of the Participating Organisations listed at (A) as aClerk or in a similar post in that cadre, is required to register for the Common Recruitment Process- (CWE Clerks-III). 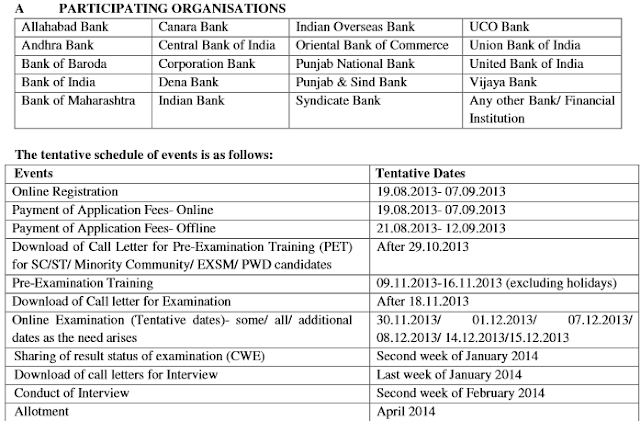 Candidates who appear and are shortlisted in the examination, will subsequently be called for a Common Interview to be conducted by the Participating Organisations and co-ordinated by IBPS. Depending on the State/UTwise available vacancies in Participating organisations, candidates shortlisted will be allotted to one of the Participating Organisations, keeping in view the spirit of Govt. Guidelines on reservation policy, administrative convenience, etc. Degree (Graduation) in any discipline from a recogn ized University or any equivalent qualification recognized as such by the Central Government. Computer Literacy: Operating and working knowledge in computer systems is mandatory i.e. candidates should have Certificate/Diploma/Degree i n computer operations/Language/ should have studied Computer / Information Technology as one of the subjects in the High School/College/Institute. Age (As on 01.08.2013):Minimum: 20 years Maximum: 28 years i.e. a candidate must have been born not earlier than 02.08.1985 and not later than 01.08.1993 (both dates inclusive. (i) scan their photograph and signature ensuring that b oth the photograph and signature adhere to the required specifications as given in Annexure II to this Advertisement. (ii) If desiring to make Online Payment of the requisite application fee/ intimation char ges keep the necessary details/documents ready (In case of Offline Payment i.e. CBS candidates have to apply online, obtain a fee payment challan and then remit the nec essary application fees/ intimation charges). (iii) have a valid personal email ID, which should be kep t active till the declaration of results of this ro und of CWE. IBPS may send call letters for the Examination etc. through the registered e-mail ID. Under no circumstances, a candidate should share with/mention e-mail ID to / of any other person. In case a candidate does not have a valid personal e-mail ID, he/she should create his/her new e-mail ID before applying on-line and must maintain that email account.